As fellow lovers of beauty boxes or travel kits will be well aware, there is great joy to be found in a set of luxury samples. 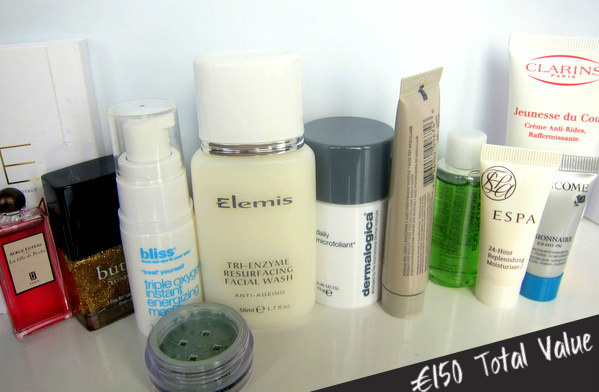 You can try out a bundle of lovely products before determining which ones are most worthy of your hardearned cash. You can pop them smugly into your little plastic airport bag and travel with an entire bathroom cabinet, just in miniature. And then there’s the aesthetic factor – how sweet are those teensy wee bottles and jars? Don't they kinda sorta make you feel a little like a giant, but in a good way? Raaaaaaaaaaaaaaaaaaaaaaaar! (Giants totally do that). Which is why I may actually have squealed just a little to get my hands on this beautiful gift with purchase from Harvey Nichols. Spend €130 on fragrance, skincare, beauty or cosmetics and you’ll receive €150 worth of treats from some of the store’s most prestigious luxury brands, including Eve Lom, Shu Uemura, Lancome, Clarins, and more (keep reading for the full list!). Alongside generous deluxe skincare samples, there’s some lovely makeup bits, too – including a full-sized Butter London polish and Bare Minerals eyeshadow. And everything comes perfectly packaged in an adorable cosmetics bag designed for Harvey Nichols by the world’s most stylish blogging bunny, Fifi Lapin. Available from 16th April and while stocks last, this has to be one of the best gifts with purchase I’ve seen in a long, long time. If you need to stock up on any of your favourite beauty bits or have been planning a little payday splurge, I’d urge you to save up your pennies and head straight for Harvey Nicks! Tell me, cos I’m curious like that – is this something that would sway your purchasing decisions, or do you have shopping nerves of steel? I wish I had the 130 euros/ pounds to spend in the fisrt place! Looks so great, love the bag! Oh this is the creme de la creme of beauty gifts! Of course I would be easily swayed hahah!!!! Oooh that's gorgeous, would definitely spend €130 to get that, I need to stock up on alot of basics right now so It'd be easily done. I don't technically 'need' anything but it's such an amazing gift.. I might buy it & give it to my mum to give to me for my birthday! This is amazing, If Daily Microfoliant is in there, I definitely need it! Not a hope. I cannot part with €130 in one go except for a flight ticket. The nail polish, bag, and Shu Uemera may sway me! I don't think I'd spend the money specifically to get it but if I needed perfume and I was spending €70-€80 anyway I probably would go the extra €50 - it's a great marketing idea, considering the €50 would buy a couple of the bits in that bag anyway! That's a pretty awesome GWP! 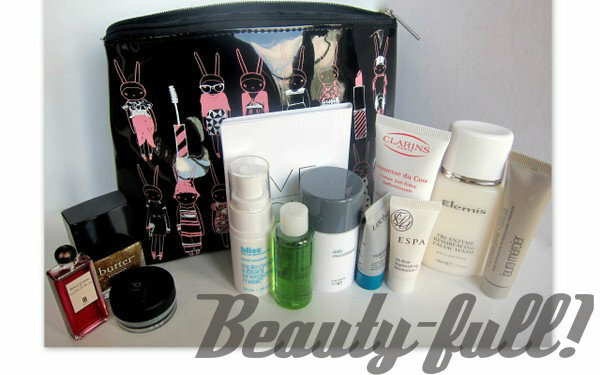 The deluxe samples are great and I love that Fifi Lapin cosmetics case. you had me at Fifi Lapin. That is the cutest case ever! That is such a great gift, I could easily spend 130 on beauty products..this would just spur me on even more! It would definitely sway my decision :) I have shopping nerves of mush haha. This is an amazing freebie set!! Seriously, I love several of these brands.. I do really love the trial sizes, they're adorable and always helpful in finding new favorites! That looks like a great gift! it would definitely sway me! hahaha i love all of those products and the fifi lapin bag! Ooh that Butter London polish looks right up my street! The make up bag is so cute too, what a great free gift! Oooohwowza, so many lovely goodies! Ems I think they had a huge promotional idea, too bad I can't take advantage of it here in Italy! 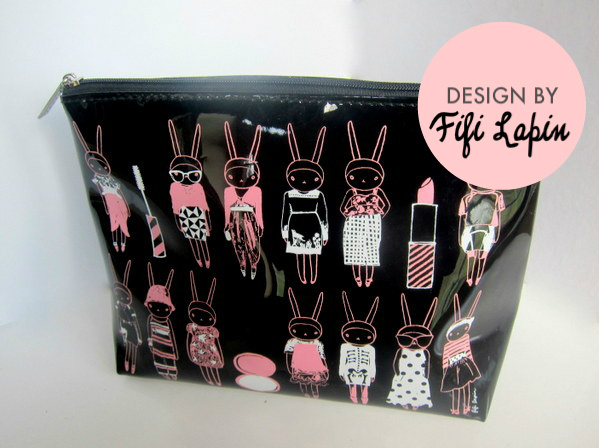 And the Fifi Lapin trousse is so adorable!!! Looks like such a great bunch of products together & the bag is super cute! That is a nice gift indeed. That bag looks so lovely. I like this.